The Claytons: A musical family saga from Los Angeles, some of which also played episodes on the German Danube. 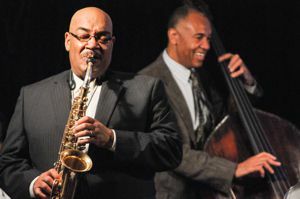 John Clayton, one of the most elegant bassists in the jazz world, and his brother Jeff Clayton on alto saxophone, have in the past several times with their great orchestra and soulmate Jeff Hamilton in the Neuburger Hofapothekenkeller or the Audi Forum Ingolstadt. Even John’s gifted son Gerald on the piano was already frolicking with his relatives, with Charles Lloyd or his own trio in “Birdland”. Now, the two older Claytons give the honor with a bundle full of violently swinging, excellent songs. John Clayton, who made a name for himself as a big band leader and arranger, and Jeff, no less a person than Stevie Wonder helped to start the career and the side of Ella Fitzgerald, Sammy Davis jr. Frank Sinatra, Lionel Hampton, Michael Jackson, Kenny Rodgers and Earth, Wind and Fire gained valuable experience, this time rely on illustrious support. With the trumpeter Terrell Stafford comes one of the most interesting protagonists of this instrument. Even pianist Sullivan Fortner and drummer Obed Calvaire are among the cream of the US mainstream scene. A real treat! Even pianist Sullivan Fortner and drummer Obed Calvaire are among the cream of the US mainstream scene. A real treat! Even pianist Sullivan Fortner and drummer Obed Calvaire are among the cream of the US mainstream scene. A real treat!